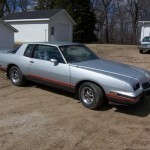 By 1986, the G-body Pontiac Grand Prix that was introduced in 1978 was showing its age. Although Pontiac gave the Grand Prix a body reskin in 1981, the Grand Prix could not match the aerodynamics of the Ford Thunderbird introduced in 1983. 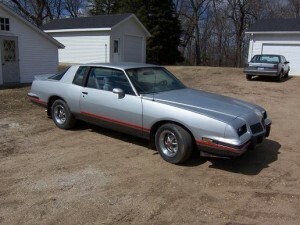 Pontiac’s solution was the Grand Prix 2+2 that was introduced in 1986. The Grand Prix 2+2 model was offered as a street version of an Aerocoupe body that Pontiac used for NASCAR competition. Similar to what what Chevrolet had done with the Monte Carlo SS Aerocoupe in 1986. The 2+2 had a specific aero nose, bubble rear glass and a fiberglass trunklid with an integral spoiler. The 2+2 models came fully loaded and came equipped with a 305 cubic inch four-barrel, the 200-4R four-speed automatic transmission and a 3.08:1 rear axle ratio. The 2+2 featured a two-tone paint job with silver on top and gray on the bottom, with 2+2 decals and striping and 15×7 steel Rally II wheels. The 2+2 remained unchanged in 1987. The model would not return for 1988 as Pontiac would introduce an all new, front-wheel-drive Grand Prix, which would be far more aerodynamic. For more about the classic Pontiacs, see the post on the 1968-1972 Pontiac Grand Prix or the 1967-1969 Pontiac Firebird. 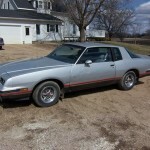 This entry was posted in Grand Prix, Pontiac and tagged Areocoupe, G Body, Monte Carlo, NASCAR. Bookmark the permalink.